Been waiting for a new episode and you open with a Dark Star! The Dark Star is gorgeous. The AUD recording from MIT is surprisingly clear given the age and available technology at the time it was recorded ... and your editing in the Playin' surprisingly fits well (even though Playin' wasn't added to the repetoire until 1971). Thanks for the work you do on this! jeezus, noah, “going right to the heart of the matter” indeed! You’re pulling absolutely no punches with this one! There must be some intense Sunday afternoons at your house. Can’t you find some room for a rippin Man Smart Women Smarter or do like a “best Bobby slide solos” segment or something? Have mercy on us already! seriously, though, that was a dynomite two hour selection. Good call on the 7/26 Dark Star! I listened to the Dark Star in the nether hours of the morning, as I woke from a fitful sleep. I felt as if it swirled and whirled through vortices of my brain and I went in and out of many images evoked by the changing directions and inflections of the band. They went out and returned to base, and so did I, finally landing on clouds of delusion. A most stunning performance. Time to awaken to another grateful day. Are you reading my notes?! The next three podcasts will be, "Best of Bob's Slide Solos," "How Many Roosters Can Crossfade Together In Under Two Hours," and "The Best Of Bobby's 'heh HEY's'." Bongo, you're in for quite a day! Dark Star is way out there... 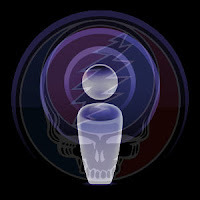 I almost melted down on the spot as Garcia's twisted jam struck a nerve in the base of my skull.. this Dark Star is eeerie!!! Great choice! The July 1972 Dark Stars (post Europe Tour) are so far out there... Both this show (and go check out 7.18.72 NJ) somehow find their way into a fitting transition into Comes A Time.. Rare indeed.. keep up findign the great and less known GD gems!!! any plans on reviewing more shows from '69? Hi, I first want to acknowledge that this is a most wonderful idea. I like your voice over the weird background music. Perhaps you could find some 5 minute Dead piece that is low key where you could talk over? Nonetheless excellent. And I think it's a great idea NOT to tell us what show the music was played, initially. We Deadheads have such a biased listening regimen based on the year, venue, etc that sometimes we can't just take a step back and listen to THE SONG. I found myself on several occasions wanting to fast-forward to the location but I didn't. It completely changed my listening experience. And I think that is wonder. "How Many Roosters Can Crossfade Together In Under Two Hours," - HA!!! anyway, another great job. thanks. that transition into "comes a time" is just such a nice moment. love the background drone music, btw. what is it? Steve, Thanks for commenting. That tactic of not telling the date of a selection was born out of years of Listening Sessions among friends where we often will queue something up with no intro. It adds a certain layer of discovery to the ears of a seasoned Deadhead, for sure. Of course, we can never get too far before people shout out dates and eventually the actual show in question is revealed. I'm glad you're comfortable waiting until the end (resisting hitting the FF button). I like using the tactic, but not for every selection. This isn't a game show, after all. (But it would make for a killer game show, wouldn't it? Why isn't there a Dead Channel on cable, anyway? Yup, the background ambiance is taken from the final 10 minute portion of the CD Membrane, by the artist, Jhno. It's an out of print Ambient Electronica album, most of which is more beat and instrument driven. I hunted it down years ago, spending $30+ for it on eBay. Good stuff. Thanks for Sharing? Any dates of new shows?